Well there's no resting at holiday time - I think I'll probably blog more this month than I have all year! A slight tall tale, but not far from the truth. Soooo. It hasn't escaped my notice that my kiddo has officially hit tweendom. As in all sparkly glittertastic mania all the time. The child could now write an in depth report on shiny lipglosses and chapsticks and what combinations provide the ultimate smell and shimmer (the smell is very important). I was writing out a holiday wish list to some aunties the other day and I realized, this here is a blog post. So here are some things that would greatly appeal to my almost-eleven year old girl, and they might also strike a chord with yours? Let's take a peek. I hope she doesn't see this blog post because half of the items on here are sitting in my closet. 1) A few weeks ago, my kiddo discovered the music from 'Hamilton'. Obsessed isn't even the right word. What's more than obsessed? MY KID, regarding the song that King George sings, 'You'll Be Back'. So she's getting the CD and we can all merrily sing along together. I got the 'clean' version, which has most of the mega-swears taken out, but there's still a few sprinkled in so if you're very sensitive to that sort of thing, you should use your own judgment. My child's grandfather curses like a sailor, so we're a bit immune, and I think anything on the CD is going to sail right over her head....and the music is worth it, in any event. 3) The Shopkins spell that has throroughly entranced my daughter for over a year now is still going strong. I have been Very. Specifically. Instructed. - requested?? to please please please consider getting her the Season 6 Chef Club set of Shopkins. I have taken that request under advisement. 4) Along with emojis and Shopkins, Pusheen the Cat is very popular with my kiddo and her BFF. Stuffies, books, stickers - if Pusheen is on it, then they're excited about it. So I'm thinking this Pusheen 2017 calendar might be a big hit. I'm HUGE on giving calendars! It's not Christmas in our house if a calendar isn't floating around. I like to give one to each family member. My most memorable calendar gift was to my beloved stepfather - he got 'Toilets Around the World'. 5) 'The Secret Keepers' by Trenton Lee Stewart is his newest and since Julia is reading book 1 of his 'The Mysterious Benedict Society' series and is MEGA HOOKED, I think this newest offering about a magical watch sounds right up the alley of a kid who's a fan of these books. Especially for the kids who have just wrapped up the 'Harry Potter' series and are searching about listlessly for something else to fill the empty hole in their hearts left by those books. 6) And speaking of Harry Potter, let's chat about that for a wee moment. THIS WAS THE YEAR. This was Julia's Harry Potter year. She had read the first three books with her daddy a couple of years ago, but this past year, Julia read the rest of the series on her own. And watched all of the movies. I was a stickler for No Movie Before the Book. So to advance with a movie, she had to read the corresponding book first. She dressed up as Luna Lovegood for Halloween. She and her friends play Quidditch at recess. (I'm not sure how they're doing that, but it sounds like they're having fun!) It's pretty much been all Harry Potter, all the time this entire past year. So...Harry Potter Clue. First of all, Julia is huge 'Clue' fan. It's her favorite game of all time. She never gets tired of it! (sigh) It seems like the game might be a hit. The rooms can move around apparently and there are secret passageways and the board itself is very cool looking. So it appears more Clue might be in our future. 7) My child is obsessed with gum. Are all kids this into gum??? My kiddo seriously loves gum. And she saw this make-your-own chewing gum kit in a store and was like 'THIS PLEASE'. She was very adamant about this particular set (we saw a couple of them) because it comes with a cool gum carrying case. So what do you think? Are your tweens loving this type of stuff as well? If you have any other interesting ideas, I am ALL EARS! I think this is such a fun age - my kiddo and her friends are starting to move into older themed books and games and interests, but there's still very much a love for toys and stuffies. Julia told me not long ago - "Adults don't think kids my age are still interested in toys, but we are!" Do you have anything I should know about? Let me know if you do, I'm always Collecting Ideas. I have sooo been considering HP Clue! 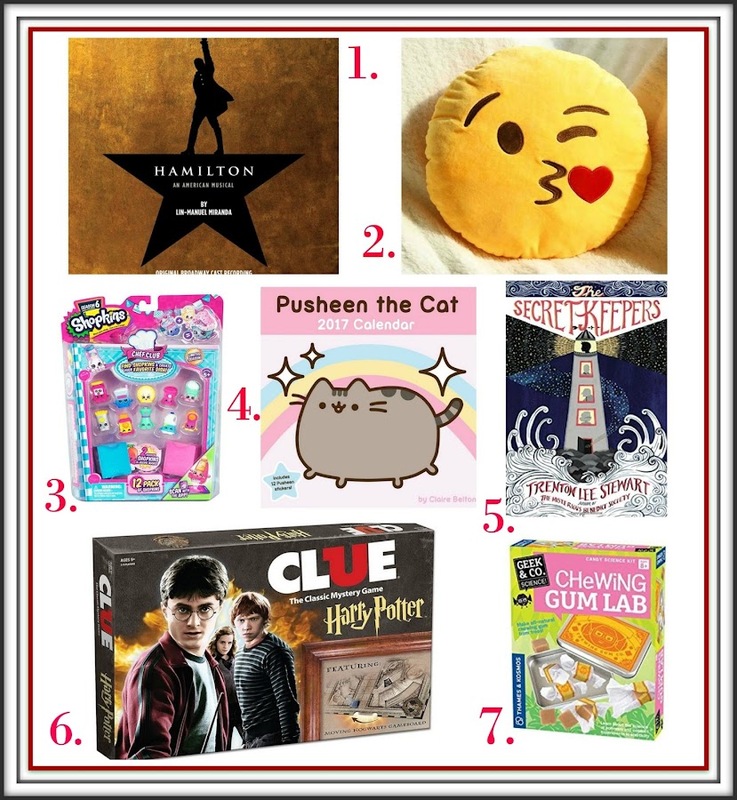 Hamilton,HP,and the Stewart books aside, this list so matches up with my 9-year-old: Pusheen, Shopkins, emojis... She is my ever-fashionable sparkly one. Big Sis is so into everything Potter. I LOVE that our girls did the Potter thing this year! we need another Clue game like we need a hole in the head, but.....she's so into Clue. And so into Harry Potter. And it seems like there's enough added variety to it to make it worth while, so I went for it! Fantastic list! my girls are obsessed with Hamilton too! dude. fiona is obessed with pusheen and the calendar is on my list of things to get her. and i JUST bought that HP clue 2 days ago. for fiona but TOTALL FOR ME. My 11-year-old is also obsessed with her "lippies"! She and her friends are also crazy about "squishies", wondering if your west coast teens are into them too? They are strangely mushy and spongy, usually shaped like food, and from Japan (natch), so maybe too late to add to the list this holiday season. Shopkins seems to be over, but still into those chemistry sets to make candy / gum / lip gloss, etc.